It’s a no-brainer, families across Windsor-Essex County will have an increased amount of cooking fat waste that will be generated from all of the great dinners over the holidays. 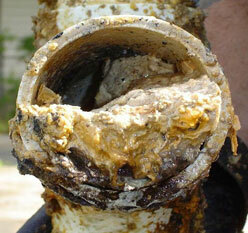 The DRCC would like to remind everyone that sewer backups caused by clogged lines from FOG (fats, oils and greases) can cause damage to homes, public infrastructure damage and can also affect public health. If the lines are clogged, then the lines cannot move our sanitary waste effectively through the system. Sanitary sewers are connected to homes and their kitchen and bathroom sinks, dishwasher, toilets and floor drains. The wastewater from these lines goes to a plant for treatment prior to be flushed back into a river or stream. Storm sewers are typically located in a curbed area on a street, a parking lot or alley way. Untreated rainwater or runoff is collected here and is directed back into a river or stream. It is extremely important that nothing is poured into the storm sewer since this water is untreated. Check out the DRCC’s Wastewater: Where does it go video! Have you ever wondered what happens to water and other substances when they are flushed down our drains and toilets? It shouldn’t be a mystery, and the City of Windsor and the Detroit River Canadian Cleanup initiative created a wastewater video to help de-mystify the topic, and educate viewers. Most of us don’t really think about what happens to water once it’s flushed or drained away and out of sight. It all has to go somewhere, though, and what we put down our drains can have a big impact on our home and our environment. The video follows the flow of wastewater from a home in Windsor to one of two places: the waste water treatment plant or the Detroit River. There are many household items that are branded as ‘flushable’ that really shouldn’t be put down the toilet. What’s more, some items go directly back into our rivers and lakes without treatment. The Essex Region Conservation Authority (ERCA) and the Windsor Essex County Environment Committee (WECEC) is hosting a Green Speaker Series event on Wednesday December 14th 2016 at 7:00pm at the Essex County Civic Centre (360 Fairview Ave West, Essex, ON). 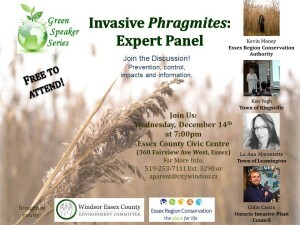 Join the discussion and hear from an expert panel who will discuss invasive phragmites. For more information please call 519-253-7111 Ext. 3290 or e-mail aparent@citywindsor.ca.